Washington, D.C., 4 October 2004 - Journalism professor Ralph Begleiter of the University of Delaware today filed suit under the Freedom of Information Act in federal district court for copies of the military's photographs and video of the honor guard arrival and transfer ceremonies at Dover Air Force Base for servicemen and women killed in the Afghanistan and Iraq wars. The lawsuit challenges the censorship policy initiated in 1991 by then-Secretary of Defense Richard Cheney, and continued by the Pentagon under the Clinton and Bush Administrations. 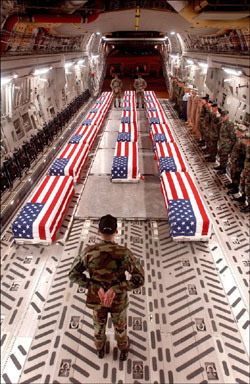 The 1991 policy reversed the traditional American practice of honoring the fallen in solemn public ceremonies centered on flag-draped caskets. In April 2004, the Air Force Mobility Command released under the Freedom of Information Act 361 photographs of recent Dover ceremonies, only to have the Defense Department call the action a mistake and hold up any further releases. A Department of Defense Spokesperson, Deputy Under Secretary of Defense for Military Community and Family Policy Molino, explained "[i]f for some reason we find that the policy is inconsistent with the FOIA we'll look at whether or not the policy needs to be changed." Working with the National Security Archive, a research institute in foreign affairs that uses the Freedom of Information Act to obtain information about U.S. government operations, Mr. Begleiter has systematically requested all still and moving images of the return of fallen soldiers to Dover Air Force Base from October 2001 to the present. "This is not a partisan political issue," says Mr. Begleiter. "The ban on releasing such photos has been imposed and supported by governments of both parties. It's all about allowing the American people to accurately and completely assess the price of war. The Pentagon's claim that personal privacy is the reason for blocking release of pictures of soldiers' coffins doesn't make sense. The pictures do not identify any individual soldier, and the Pentagon has selectively allowed or released pictures when the political equation has been different, including when Americans were killed in terrorist attacks in Kenya and Tanzania and in the attack in Yemen on the U.S.S. Cole. They even permitted the release of some pictures of returning casualties from the Afghanistan conflict." Mr. Begleiter is represented by Daniel Mach, a partner at Jenner & Block LLP in Washington, D.C., and by Meredith Fuchs, general counsel of the National Security Archive at George Washington University. Mr. Begleiter is the University of Delaware's "Distinguished Journalist in Residence" and has taught communication, political science and journalism at the University of Delaware since retiring as CNN's world affairs correspondent in 1999.